The dry climate of the Egyptian desert offers an ideal environment for the preservation of ancient artifacts. As the sands of Egypt has preserved also numerous Coptic manuscripts, the transmission of the literary heritage of Egyptian Christians can be documented quite well from its beginnings in the 4th century CE until its decline in the 12th-13th centuries CE, when it was completely superseded by Arabic. 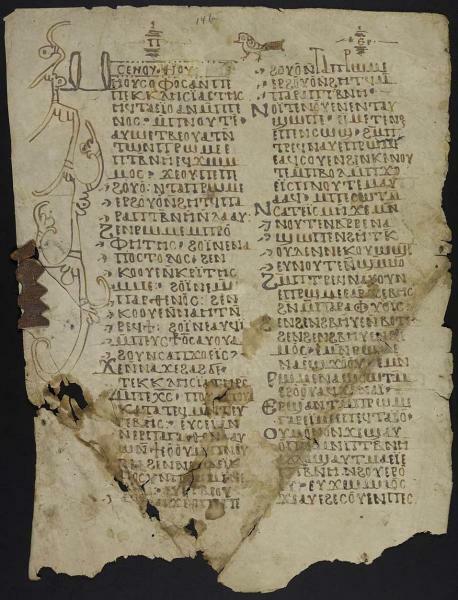 This exhibit aims to show some of the hallmarks of Coptic literature using manuscripts kept in the Special Collections Research Center of the University of Michigan Library. Topics explored include the main Coptic dialects; bilingualism in Egypt; books read by the Egyptian monks; and the works of Shenoute the Great, the most important author of Coptic literature. This exhibit is curated by Dr. Frank Feder and Dr. Alin Suciu from the Göttingen Academy of Sciences and Humanities. The exhibit and related programming are offered with support from the Department of Middle East Studies and the Kelsey Museum of Archaeology. Join us for an opening lecture and reception at 4:30 p.m. on November 12 in the Hatcher Library Gallery.